Government Adda 247 Engineers Jobs Government jobs ITI ITI Limited Recruitment for 110 posts. 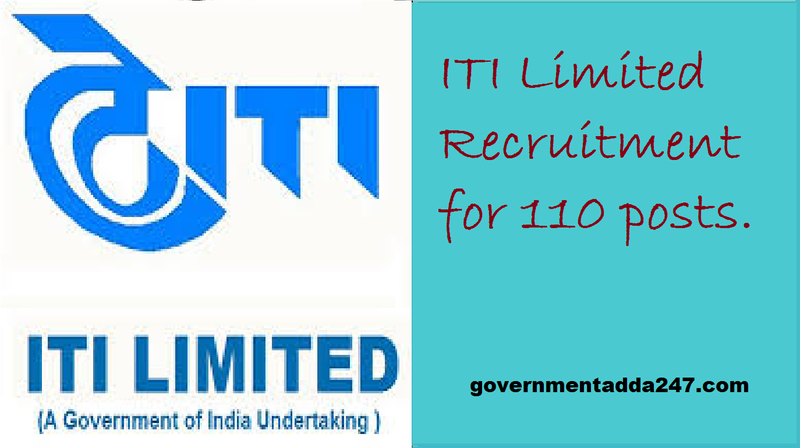 ITI Limited Recruitment for 110 posts. ITI Limited Recruitment, ITI recruiting for the various posts of Assistant Executive engineer trainee and trainee technical assistant as per the notification number ITI/COMP/01/28/18/08 and ITI/IM/PAD/113/CTA. The applications are inviting from the eligible candidates. The eligibility criteria for the posts are aspirants must have an engineering degree or engineering diploma. The total number of vacancies for recruitment is 110. The applications are inviting from the eligible aspirants and the last day to submit online application is 25 September 2018 and last day to submit a print of application by post is 27 September 2018. Appointments will be initially as AEE Trainees for a period of two years.ITI Limited Recruitment, To know more about the vacant post check the detailed advertisement given below. Dy. General Manager-HR [NS&M] ITI Limited; Network Systems Unit, F-100, Dooravaninagar, BANGALORE -560 016.